Advertising Indeed Works – My Story of FB page! HomeResearchAdvertising Indeed Works – My Story of FB page! Trying to get the attention of people by means of advertising is something we feel uncomfortable about. That’s because we do not like to bother others for our personal gain. We expect the people to find us and approach us by themselves. I have the same attitude. However, I found that this philosophy doesn't work well in reality. In this article I want to draw your attention to my small experience from Facebook. I hate the occasional invitations to like a Page as much as I hate the random game requests. However, the day before yesterday one of my friends approached me through message to like his page. Again I don't like to randomly "Like" Pages as that clutters up my timeline. However, refusing to like his page would also disappoint him. Therefore, I stroke a win-win deal for both of us. I agreed to like his page on the condition that he too will like my page. I am a hobbyist artist and I have made a separate blog and a Facebook Page for it. The page was created long ago, almost one and a half year ago and I hadn't advertised it much. Therefore, although I used to share my artworks occasionally, I didn't get much likes in the page. In the beginning, I got around 70 likes and in a period of almost one year I probably got only 5 additional likes. So, that day I realized the need to advertise my page. 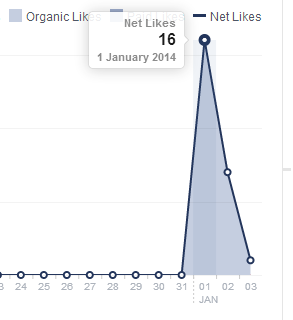 Getting more likes will help my blog visitors to have positive impression about my blog as well as Page itself. Moreover, more likes will increase the social media traffic as well in the long run. Therefore, I thought of inviting my friends to like my page. I invited all the suggested persons in the list to like my Page and the number of likes in my page went up by 16 on the very day. I got 8 more likes yesterday. This led me to questions, why didn't my friends discover my art page when they already knew about my art well? And even if they have discovered it why didn't they like it by themselves? Now if they had disliked my page in the past, then why do they like it now? However, I see this situation a typical one and similar to business situations. My friends aren't to be blamed in any of these situations because they didn't give much thought to this matter. They simply didn't show proactive response to my Page. However, when they got my invitation, they reacted soon enough as if they just learnt about it. Now as I contemplate, I think majority of people are less proactive but highly reactive in nature. So, they will have tough time in finding you and your product. But if you advertise it, they will easily evaluate and show reaction to it. If your product is good you’ll keep getting positive reaction. Probably that is how thing works in reality. I believe advertising as evil for two reasons: First, it disturbs people (hence unethical) and second, it wastes our resources (effort, money or both). However, I found advertising to be essential as well: first to get attention, and second to remain in the mind and memory of people. Otherwise, people will soon forget you and your product, and start remembering the ones who keep advertising. In a nutshell, advertising is essentially a necessary evil, which indeed works in reality!